5 hot tips to stop neck and shoulder pain FAST! If you suffer from neck or shoulder pain then this article is a must-read. In today’s society so many of us are desk-bound and sedentary as a result of our occupation. This is leading to a huge increase in tension across the neck and shoulders as a result of all the sitting that we do. 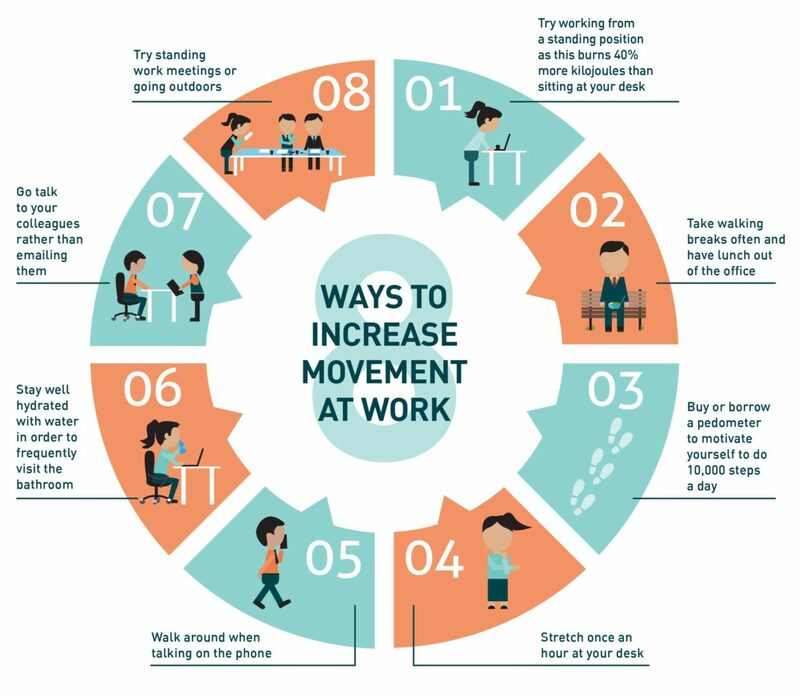 Whether it is sitting at the desk at work, sitting in the car or train, sitting down eating or sitting down watching TV – we all sit a lot. If we’re going to be doing so much sitting, we better make sure we’re doing it properly and that’s where we can start today. Follow these 5 hot tips and you can virtually eliminate your neck and shoulder pain instantly. 1. Desk setup and proper ergonomics are crucial. 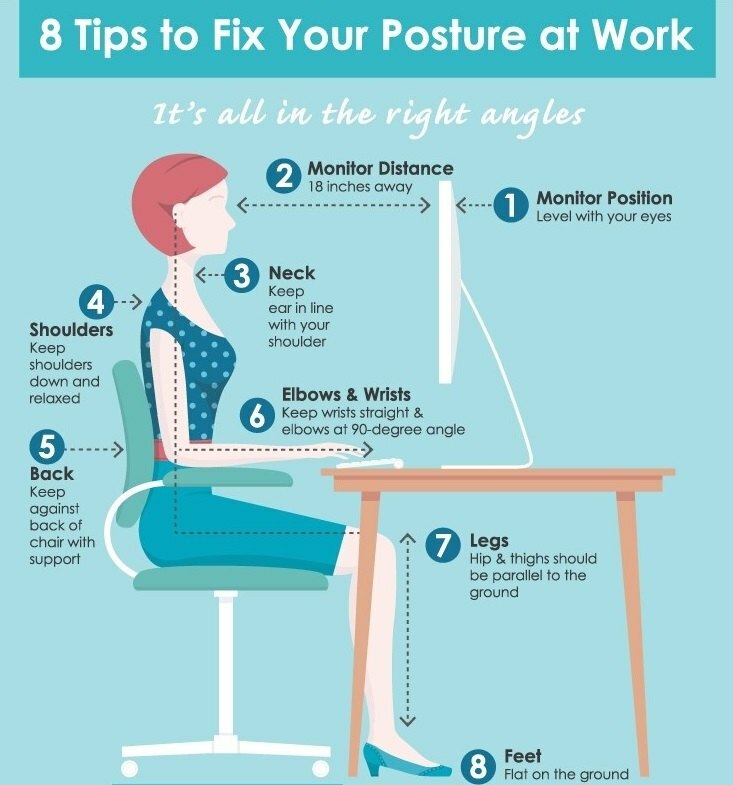 A proper ergonomic setup will ensure that there is the correct amount of loading across all our joints and we are sitting in a manner that is least strenuous on the body. The monitor should be about arm’s length away. Keyboard height should be at a level where the elbows are resting at a neutral 90-degree angle. Seat height should be at a level where the hips and knees are at a neutral 90-degree angle. These same three principles apply for standing desks as well! Standing desks are great as you can easily switch between two comfortable setups, leading to less fatigue throughout the day. Posture at the desk and in general life is a huge factor in shoulder and neck pain as well. An upright posture is the most energy efficient posture that you can be in. The further that we stray from this upright posture, the more strain is placed on the muscles and joints. As the upper back hunches, the head pokes forward and the shoulders round (as seen in a typical slumped posture) muscles of the neck and upper back and shoulders are overstretched. From this position these muscles are forced to work much harder, they become fatigued and eventually painful from lack of blood flow. Hence living in a posture as close to neutral as possible is incredibly important. It will take the strain of our muscles and joints and allow you to sit longer without pain. 3. Movement is medicine. Motion is lotion. Whether it is sitting, standing, crouching or lying down, the body was not designed to be in the one position for long periods of time. The body thrives when it is taken through its full range of motion and is used dynamically. Conversely, the body will suffer if it is too still or only used partially – so moving around regularly is key to preventing ongoing stiffness and pain. It doesn’t need to be a lot, but regular activity and movement can’t be understated. Pilates is a great tool that many people use to get the mobility that they require to live happy and healthy lives. But even going for a walk at lunchtime every day will give your body a get the blood flowing again and also get your daily dose of vitamin D.
Strengthening is key to good health and a pain-free life. Typically when injury or pain occurs, it is because the muscles over been overloaded or asked to do more than what they are capable of ( i.e sitting still for 8 hours in a row). If steps are taken to strengthen the body, (Pilates is great for this too!) the body will then have a greater strength and become more resilient. It will be able to tolerate more and be less likely to become injured. On the other hand, if the body is weaker and no steps are taken to strengthen, it is less resilient and more likely to become strained and painful. Osteopathy is great at relieving shoulder and neck pain FAST. The body is amazing in its self-healing mechanisms, but sometimes needs a helping hand and a gentle push in the right direction – which is where osteopathy can be really beneficial. If you are struggling to get your neck and shoulder pain under control, Osteopathy will help. Osteopathy may involve a combination of soft tissue massage, joint manipulation, dry needling, education, and lifestyle advice. This holistic assessment and treatment by an experienced osteopath works wonders in neck and shoulder pain. Start implementing these 5 hot tips today and feel your neck and shoulder pain disappear overnight.